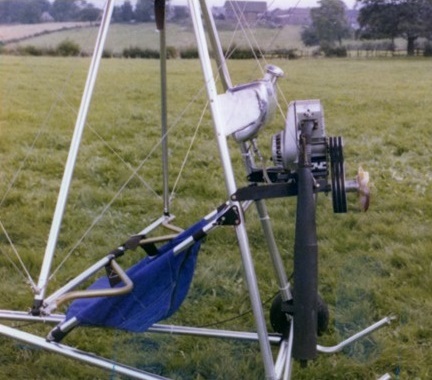 The Skytrike was the first British produced trike unit; allied to Hiway's simple but effective Super Scorpion wing, (usually in the larger 'C' size). Designed by Frank Tarjanyi, the Skytrike/Super Scorpion C was introduced in 1979, the combination of a single-surface wing and 10 hp did not exactly make for high-performance and its pilot weight range was distinctly limited, but the basic formula was obviously right. The power shortage was solved by the introduction of Robin engines, in which form the trike unit was dubbed Skytrike Mk II, with the Valmet-engined version being known retrospectively as the Mk I. Two versions of the Mk II were offered, a single-cylinder 250 cc version which usually retained the Super Scorpion wing, and a twin-cylinder 330 cc version which typically is flown with the Hiway Demon wing. Hiway's next move was an attempt to retain the performance of the 330 cc version but save some weight, by using the small but powerful liquid-cooled Hiro-Delta MkI engine to produce the Hiro Skytrike trike unit. The result was an aircraft with an impressive performance for its engine size, due partly to the elimination of drive belts in favour of integral reduction gearing. Moreover, the liquid cooling allowed the inclusion of an effective carburettor anti-icing system. Other than the engine, the only significant change to the trike unit was the replacement of the front wire by a strut. Despite these qualities, the Hiro Skytrike found few buyers in a market which was becoming enamoured with the smoothness and reliability of the 330 cc Robin. It was not helped by the Skytrike's growing reputation for poor detail engineering. 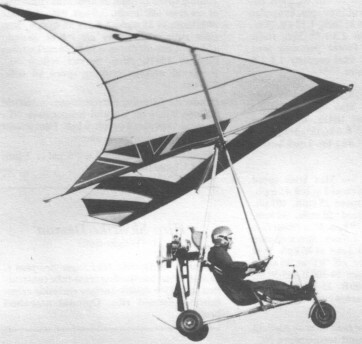 Having made the initial great leap to power, it seemed that the company's heart had returned to soaring; the marketing and detail development of the Skytrike were neglected and the company's resources concentrated instead on a radical new hang-glider called the Explorer. When this was received less than rapturously by the hang-gliding world, it spelt the end of the company. 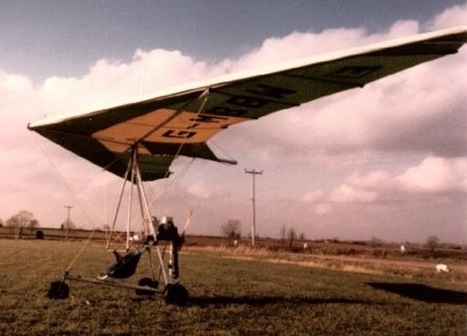 In 1983 Hiway Hang Gliders Ltd was in liquidation. The Mk.II 330/Demon wing has floating cross-tube construction with 75% double surface enclosing cross-tube; pre-formed ribs, and optional nosewheel brake. Engine: Valmet, 10 hp at 5000 rpm. Propeller diameter and pitch 54 x 30 ft, 1.37 x 0.76 m.
Max static thrust 75 lb, 34 kg. Power per unit area 0.05 hp/sq.ft, 0.5 hp/sq.m. Fuel capacity 2.1 US gal, 1.8 Imp gal, 7.9 litre. Wing span 33.5 ft, 10.21 m.
Mean chord at 5.9 ft, 1.80 m.
Total wing area 198 sq.ft, 18.4 sq.m. Max take-off weight 286 lb, 130kg. Max power loading 28.6 lb/hp, 13.0 kg/hp. Max level speed 26 mph, 42 kph. Never exceed speed 40 mph, 64kph. Max cruising speed 22mph, 35kph. Economic cruising speed 22mph, 35kph. Stalling speed 17 mph, 27 kph. Max climb rate at sea level 100 ft/min, 0.5 m/s. Min sink rate 190 ft/min at 21 mph, 1.0 m/s at 34 kph. Best glide ratio with power off 8/1 at 22 mph, 35 kph. Range at average cruising speed 51 mile, 83 km. Engine: Robin EC25PS, 18 hp at 7000 rpm. Propeller diameter and pitch 52 x 31 inch, 1.32 x 0.79 m.
Max static thrust 1301b, 59kg. Power per unit area 0.09hp/sq.ft, 1.0hp/sq.m. Max take-off weight 3491b, 158kg. Max wing loading 1.76 lb/sq.ft, 8.6kg/sq.m. Max pow-er loading 19.41b/hp, 8.8kg/hp. Max level speed 30 mph, 48 kph. Never exceed speed 45 mph, 72kph. Max cruising speed 25mph, 40kph. Economic cruising speed 25 mph, 40 kph. Stalling speed 18 mph, 29 kph. Max climb rate at sea level 300 ft/min, 1.5 m/s. Min sink rate 250 ft/min at 25 mph, 1.3 m/s at 40 kph. Best glide ratio with power off 9/1 at 25 mph, 40kph. Take-off distance 90-100ft, 25-30 m.
Range at average cruising speed 50 mile, 80 km. Engine: Robin EC34PM, 32 hp at 6500 rpm. Propeller diameter and pitch 52 x 30 inch, 1.32 x 0.76 m.
Max static thrust 180 lb, 82 kg. Power per unit area 0.18 hp/sq.ft, 2.0 hp/sq.m. Fuel capacity 2.4 US gal, 2.0 Imp gal, 9.1 litre. (Early aircraft used a 1.6 US gal (1.3 Imp gal, 6.1 litre) fuel tank.). Chord at root 8.2ft, 2.50m. Chord at tip 3.5 ft, 1.07 m.
Total wing area 175 sq.ft, 16.3 sq.m. Empty weight 195 lb, 88kg. Max take-off weight 470 lb, 213 kg. Payload 275 lb, 125 kg. Max wing loading 2.69 lb/sq.ft, 13.1 kg/sq.m. Max power loading 14.7 lb/hp, 6.7kg/hp. Max level speed 40 mph, 64 kph. Never exceed speed 45 mph, 72 kph. Max cruising speed 35 mph, 56 kph. Economic cruising speed 30mph, 48kph. Max climb rate at sea level 600 ft/min, 3.0 m/s. Min sink rate 300 ft/min at 28 mph, 1.5 m/s at 45 kph. Best glide ratio with power off 7/1 at 28 mph, 45 kph. Take-off distance 80 ft, 25 m.
Range at average cruising speed 65 mile, 105 km.